If you can't be in your back yard during winter's unwelcoming weather, then choosing and using a good garden planner is the next best thing. I like to vicariously visit spring by digitally planting rows of new seeds with my digital garden planner. Choosing the right garden planner is especially important for an urban gardener, because you don't have much room to work with. Someone in a suburban or rural space can plant willy nilly, or expand the beds to add some new squash that catches their eye in spring. Urban gardeners don't have that luxury. To maximize yield from a tiny urban space, we have to make every square inch work, and that requires careful advance planning. Even if you're just planting a few containers, planning in advance will give you lush pots full of edible treats, instead of struggling experiments. 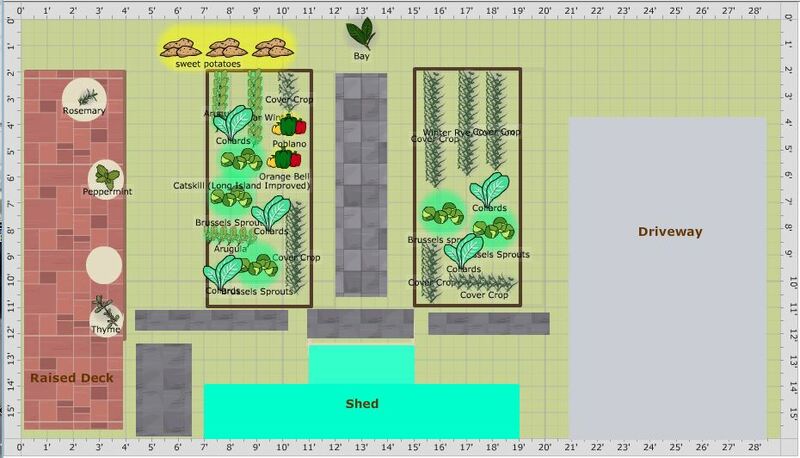 Here is our guide to the best digital garden planners for urban gardens. Digital planners have lots of resources right at your fingertips. The one I use lists characteristics and zone-specific grow times for different plants, so I don't have to look that up somewhere else. It also includes a list of what plants grow well together, which is critical information for mixed containers. Templates - once you've drawn your hardscape (buildings, fences, cold frames, raised beds, compost bins), you never have to draw them again. Simply use last year's hardscape template for this year's plantings. You can also divide your annual template into months, so you can compare January to June without having to draw 12 separate plans. Reminders in your inbox. All of the digital planners I've seen include email updates. This means you get timely reminders to plant and harvest, designed for the specific plants in your garden. Automation for advanced techniques like crop rotation, square foot gardening and winter growing. Digital planners adapt the suggested planting and grow times for plants grown under row cover and in cold frames, so you can extend your gardening season. They also mark warning areas for repeat crops, encouraging gardeners to rotate plant types to better protect against pests and disease. Square foot gardening is a technique many urban gardeners use to maximize space. I still like pencil and paper. Honestly, the feel of a soft pencil on thick paper is one reason I became a writer (is that weird?). So, using a digital planner won't stop me from sitting in my garden and jotting down plant notes in my Moleskine or sketching my colorful plant babies. But I don't have to do that anymore to keep careful records and plan the coming year. Before we start talking about specific planners, know that there are some caveats to going digital. First, because the best diagram-type planners use Flash, they won't work on an iPhone or iPad. I know there are some planners in the iPhone App store, but either they don't have charting options or the reviews are terrible, so I haven't paid for one yet to test it. Let me know if you've found one you like! Happily, Burpee offers an app for Android. I don't have Android so I haven't tested it, but it looks robust. This just means you may need to plan on your laptop, which usually isn't a problem for an urban gardener as your kitchen table is probably pretty close to your little farm. You may not be able to work outside on your laptop comfortably though, what with screen glare and all. Just be aware that most of your planning may not be super mobile. Second, once you select a digital planner, you are kind of committed to it. They aren't too expensive to prohibit changing over, but switching does mean creating all new templates and plans. Remember that you'll probably be getting regular emails from this garden planner company, and the plant lists in the planner will be based on what the company sells. So, if you're growing organic, for example, choose a company committed to organic growing. Overall, I suggest choosing a planner from a company that is small enough to feel personal and reflect your specific garden values, but large enough to stay on top of software updates (and not go out of business!). One of my favorite seed suppliers that meets all this criteria, Baker Creek Heirloom Seeds does not offer a digital garden planner (sad face!). I ended up going with the planner from Southern Exposure Seed Exchange, a company based near us in Mineral, Virginia. They grow in zone 7a, same as we do. They are committed to preserving heirloom seeds from our region, which I appreciate. And their seeds are organic and non GMO, which is how we run our garden. I'm totally comfortable clicking on "buy now" from my plant list to order seeds from them. Mother Earth News offers a detailed planner very similar to the one from Southern Exposure, but without the seed purchase option. Both the Southern Exposure and Mother Earth planners are free for seven days, then cost less than $30 annually. Burpee offers a Garden Time Planner (without charting option) that is iPhone friendly. Although you can't draw a template of your garden, you can choose your plants and zone, and the app will send you planting updates. Burpee also offers how-to videos in the app. Whichever planner you choose, winter is the perfect time to get started! Download your digital guide and start dreaming.